Beginning in year 2010, for the first time, an individual with adjusted gross income greater that $100,000 may convert a traditional IRA to a Roth IRA. For some individuals, taking advantage of this conversion may allow more wealth to be accumulated and preserved for future generations. In addition to employer-sponsored retirement plans (e.g., 401(k) or 403(b) plans), an individual may annually contribute to one or more individual retirement accounts ("IRAs"). There are two types of IRAs: traditional and Roth. Many people choose a traditional IRA over a Roth IRA because contributions to a traditional IRA are generally tax deductible (although there are income caps on taking the tax deduction), while contributions to a Roth IRA are not. In addition, you must meet certain maximum income levels to be eligible to contribute to a Roth IRA, but anyone is eligible to contribute to a traditional IRA. When it comes time for distributions, however, Roth IRAs are generally more favorable. Unlike a traditional IRA, qualified distributions from a Roth IRA are not subject to federal income tax. Moreover, a Roth IRA is not subject to the complicated required minimum distribution rules of traditional IRAs until the death of the owner. A traditional IRA generally requires the owner to take minimum distributions beginning at the age 70 ½; an owner of a Roth IRA is not required to take any distributions during his or her lifetime. To understand the significance of this, assume you have a traditional IRA, but you have other funds available for living expenses. You will be required to begin withdrawing funds at age 70 ½ and pay income tax on the distributions even if you do not currently need the funds. You also have to pay income tax on all income earned if you re-invest the distribution during your lifetime. If you have a Roth IRA instead, you would not be required to withdraw the unneeded funds. These funds could remain invested within the Roth IRA and you would not owe any income tax on the income earned. Therefore, more wealth can be accumulated and later distributed to future generations, free from income tax. Current tax law allows a taxpayer to convert a traditional IRA to a Roth IRA with two restrictions: (1) the taxpayer is required to pay income taxes on any portion of the amount converted on which income taxes have not yet been paid, and (2) only taxpayers with adjusted gross income of less than $100,000 are eligible (for single or joint filers, only). Beginning in year 2010, the adjusted gross income restriction has been lifted so anyone can convert a traditional IRA to a Roth IRA (note, however, that the income cap for contributions to a Roth IRA remain in place). There are special conversion rules if one or more of your traditional IRAs contains both tax deferred and after tax contributions. In addition, in year 2010 only, taxpayers can elect to defer recognition of the taxable income from the conversion over the following two years. The value of converting to a Roth IRA greatly depends on your current marginal income tax rate and your expected marginal income tax rate at retirement. 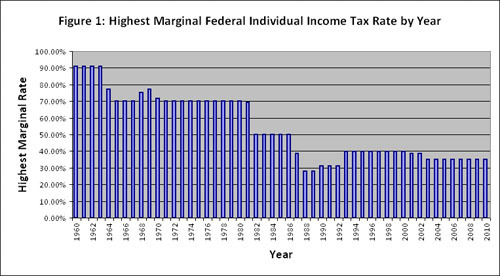 Keep in mind that the federal income tax law is subject to change (see Figure 1 illustrating the significant historical changes in the highest marginal federal income tax rate). Considering our current federal deficit, many commentators expect the federal income tax rates to increase in the near future. It is important analyze your specific situation, such as your assets, lifetime needs, and estate planning goals, to determine if this conversion is an appropriate strategy for you. Please contact us if you are interested in discussing your particular retirement assets in light of your estate planning goals.